At its High Line location in NYC, guests of The Standard have a new option for meeting people in the city. 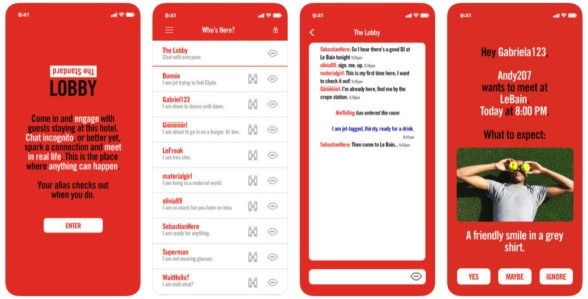 When they check in—and only while they are checked in—visitors have access to The Lobby app, where they can share as much or as little personal information as they want and connect with other hotel guests to chat and even make IRL plans. The boutique chain wants to bring back the personal connection that hotel lobbies used to offer before the era where everyone is too engrossed in their phones to interact with others in person. All information and chat histories are deleted once guests check out.